Datadog is a monitoring service for cloud-scale applications, bringing together data from servers, databases, tools, and services to present a unified view of an entire stack. These capabilities are provided on a SaaS-based data analytics platform. Datadog uses a Python based, open-source agent. Its backend is built using a number of open and closed source technologies including D3, Apache Cassandra, Kafka, PostgreSQL, etc.It’s possible to correlate and search the metrics and events to obtain different views which helps to pinpoint problems related to application’s or VM’s performance. The Datadog integration places an Agent on the vCenter server, and collects vSphere performance metrics in real time, as well as configuration events like vMotions and resource configuration changes. The agent gathers events and metrics provided by vCenter and tags them based on VMware clusters and VM configuration so that you can use the exact same cluster and VM names in Datadog. The data is continuously sent through a secure connection to Datadog where it is processed and normalized to a common timescale, along with performance data from over 80 other commonly-available tools, applications and cloud-based services. What is an Agent ? The Datadog Agent is piece of software that runs on your hosts. Its job is to faithfully collect events and metrics and bring them to Datadog on your behalf so that you can do something useful with your monitoring and performance data. For information on running the Agent through a proxy please see here; for which ranges to allow, please see here. The Agent has three main parts: the collector, dogstatsd, and the forwarder. The collector runs checks on the current machine for whatever integrations you have and it will capture system metrics like memory and CPU. 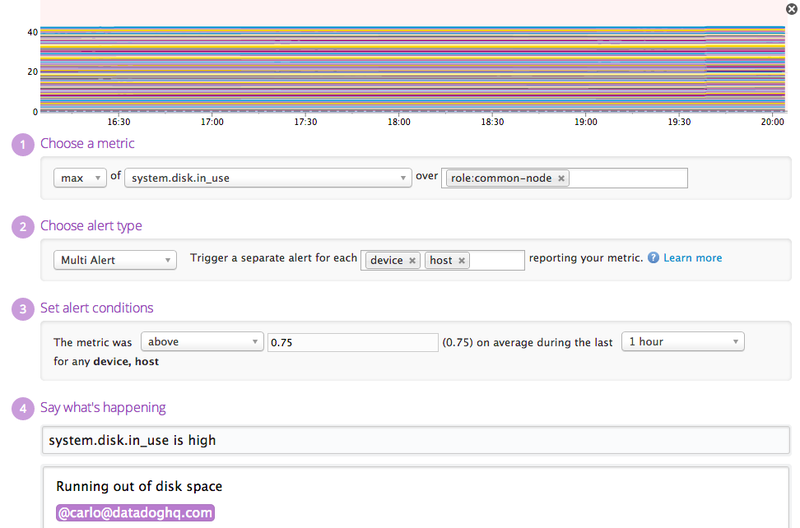 Dogstatsd is a statsd backend server you can send custom metrics to from an application. The forwarder retrieves data from both dogstatsd and the collector and then queues it up to be sent to Datadog. This will output the current system’s date, and then make a request to our endpoint and grab the date on our end. If these are more than a few minutes apart, you may want to look at the time settings on your server. DD_API_KEY=efb8XXXXXXXXXXXXXXXabf3ad bash -c "$(curl -L https://raw.githubusercontent.com/DataDog/dd-agent/master/packaging/datadog-agent/source/install_agent.sh)"
This will install the APT packages for the Datadog Agent and will prompt you for your password. If the Agent is not already installed on your machine and you don’t want it to start automatically after the installation, just prepend DD_INSTALL_ONLY=true to the above script before running it. sudo sh -c "echo 'deb https://apt.datadoghq.com/ stable main' > /etc/apt/sources.list.d/datadog.list"
sudo sh -c "sed 's/api_key:. */api_key: efb8XXXXXXXXXXXXXXXabf3ad/' /etc/dd-agent/datadog.conf.example > /etc/dd-agent/datadog.conf"
select Mysql From the Integrations list . sudo mysql -umysql -pXXXXXX -e "CREATE USER 'datadog'@'localhost' IDENTIFIED BY 'XXXXXX';"
sudo mysql -umysql -pXXXXXX -e "GRANT REPLICATION CLIENT ON *. * TO 'datadog'@'localhost' WITH MAX_USER_CONNECTIONS 5;"
sudo mysql -umysql -pXXXXXX -e "GRANT PROCESS ON *. * TO 'datadog'@'localhost';"
sudo mysql -umysql -pXXXXXX -e "GRANT SELECT ON performance_schema. * TO 'datadog'@'localhost';"
$  mysql -u datadog --password=XXXXX -e "show status" | grep Uptime && echo -e "\033[0;32mMySQL user - OK\033[0m" || echo -e "\033[0;31mCannot connect to MySQL\033[0m"
$  mysql -u datadog --password=XXXX -e "show slave status" && echo -e "\033[0;32mMySQL grant - OK\033[0m" || echo -e "\033[0;31mMissing REPLICATION CLIENT grant\033[0m"
echo -e "\033[0;31mMissing SELECT grant\033[0m"
echo -e "\033[0;31mMissing PROCESS grant\033[0m"
#           MySQL who do not run/have innodb engine support and may experiment issue otherwise. #           Should this flag be enabled you will only receive a small subset of metrics. #           against your DB to compute the relevant metrics for all your existing schemas. #           you may be subject to some negative impact in the performance of your DB. #           Please bear that in mind when enabling them. #           MySQL integration tile in the Datadog WebUI for further instructions. To validate your installation and configuration, restart the agent and execute the info command. Synchronous mousing across all graphs in a dashboard. Vertical bars are events in the context of the metric. Click & drag on a graph to zoom-in on a particular time-frame. As you hover over the graph the event stream moves with you. Display by zone, host, or total usage. We expose the JSON editor of the graph allowing for arithmetic and functions to be applied to metrics. Share a graph snapshot that will appear in the stream; clicking on that snapshot returns you to the original dashboard (via the camera in the upper right of a graph). Graphs can be embedded in an iframe, giving a 3rd party a live graph without access to your data or any other information (via the pencil in the upper right of a graph). Click and drag the time series event board and double click to start configuring . We do as much as possible to automatically categorize your servers for you, to create structure in your infrastructure with as little work as possible (unlike explicitly creating all your clusters). Thus if a new machine is tagged, you can immediately see the stats for that machine based on what was previously set up for that tag. Quickly visualize your entire environment regardless of whether it 5, 500, or 50,000 hosts. Every event in the stream can be commented on. Applies to any metric you want, revenue: data center temperature, etc. Select the Monitor Type: host-, metric-, integration-, process-, network-, event-based, and custom. See side navigation to drill into a specific type.